“Sports medicine? I suppose that means treating frisbee injuries.” I am told that this comment was made with a slight sneer and a snort of derision by a consultant orthopaedic surgeon. It reminds me of a similar incident about 12 years ago when I was attending a GP refresher course, and a consultant rheumatologist informed his audience that “there is no such thing as a sports injury”. I find such comments sad and not a little frightening. Sad, because they reveal a lack of knowledge, understanding, and a suspiciously closed mind. Frightening because a statement made by an “expert” in this way is taken at face value by the trusting recipients, who, in turn, pass it on, leading to a cascade of misinformation. Let me set the record straight. I need hardly comment on the reality of sports injuries and the practice of sports medicine; you are already reading this journal. However, I cannot allow the reference to frisbee to pass unanswered! I have been medical advisor to the British Ultimate Federation for 13 years and have seen and treated my fair share of frisbee related injuries in that time.1 Ultimate is the team sport played with a “flying disc”, and, although there are other disciplines (disc golf, double direct court, guts), it is ultimate that is the most athletic. Ultimate is like a number of other minority sports: fast, exciting, requiring fitness, skill, and team-work, and has organisational structures at national and international level (see the British Ultimate Federation web site at www.ultimateweb.co.uk/buf/). It remains curious (some might say outrageous) that it is consistently denied Sports Council recognition. Ultimate is played on a pitch 70 × 30 yards with an end zone at each end. Teams of seven oppose each other, one team attempting to string together a sequence of passes without the disc going to ground, out of bounds, or being intercepted until a final pass can be made to a team mate who is within the end zone, this being a score. The opposition are attempting to intercept (and thus gain possession) or to mark their opponent so closely that a pass cannot be made (fig 1). A player cannot run with the disc and has to pass before the end of the stall count set by his/her marker. There are no umpires (the game has a clear set of rules to deal with disputes rapidly) and the overall rule is the “spirit of the game”. Games are played to 21 points and can last two hours or more. Although this is a non-contact game, injury is far from unknown. At the recent World Club Championships in St Andrews, Scotland, 1800 players took part, and I dealt with lacerations, concussion, lateral ligament ankle sprains up to grade 2/3, anterior cruciate ligaments ruptures, fractured metacarpals, fractured radius and ulnar, intraocular haemorrhage, rotator cuff injuries, muscle tears of various grades in just about every leg muscle, all injuries typical of a fast running sport which features rapid changes of direction and diving. Other ultimate injuries have included concussion, a ruptured jejunum, scaphoid fractures, dislocated shoulders, and fibula fractures to mention but a few. So, Mr Orthopaedic Surgeon, pause for thought before you speak. Not only may you be wrong, you may also have an irate “frisbee” doctor in your audience! 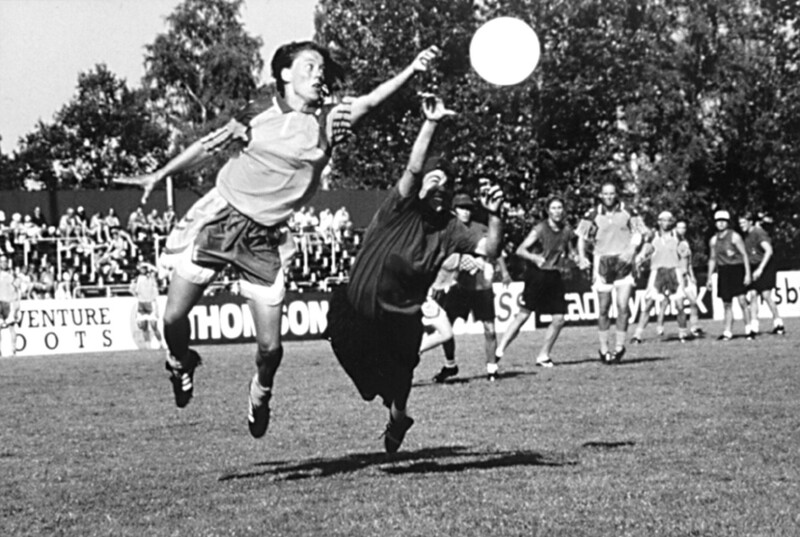 A game of ultimate in progress. Picture courtesy of Jonathan Hope. Ultimate injuries: a survey. Br J Sports Med1991;25:235–240.